Join us on one of our tubing trips along a beautiful stretch of the Niobrara River. 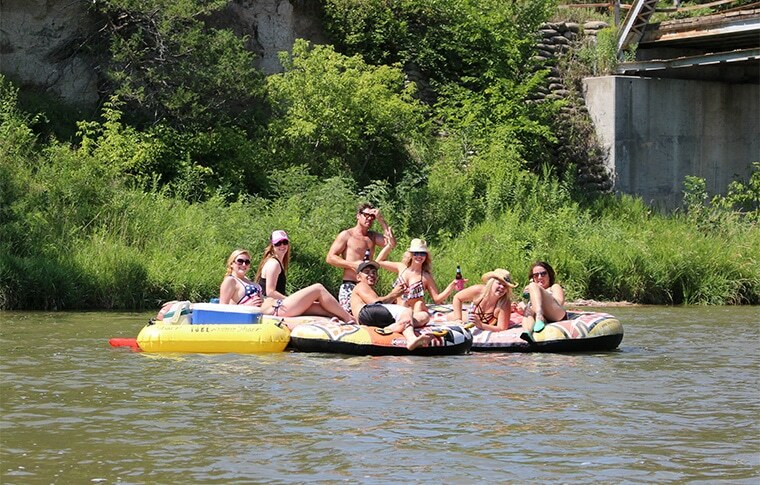 You'll have the day to relax on a giant tube, floating down the slow flowing Niobrara river. You'll pass the Smith Falls waterfall, the tallest waterfall in Nebraska as well as other areas of outstanding natural beauty. Additional departures may be available on Saturday’s in July and August. Please click Book Now to see availability. Located at 1005 East Highway 20, Valentine, NE, 69201. We will then instruct you to your launch point at Berry Bridge. Located at 1005 East Highway 20, Valentine, NE, 69201. We will instruct you to Penbrook Landing, where you will leave your vehicle, then we take you to your launch site at Berry Bridge. For groups of 8+ we can shuttle you from hotels/motels and drop you back after your tubing experience. This cost of the tubing + hotel shuttle is $80 per person. Enjoy a wonderful day effortlessly gliding down the river on an inflatable tube. Your tube will be hooked up to the other people in your group so you don’t need to worry about drifting apart! On this trip you’ll have the chance to see the impressive Smith Falls waterfall, Nebraska’s highest waterfall. Take this opportunity to enjoy the amazing scenery surrounding Nebraska’s scenic Niobrara River. Relax as the spring-fed, slow moving river gently carries you past the pine covered hills, steep cliff banks and waterfalls. The Niobrara River and its surroundings are home to a range of wildlife, including turkey, deer, rocky mountain elk, mink, otters and whole host of birds. Keep your eyes out for herons, bald eagles and other species along your trip! Staying close to the Niobrara? We can meet you at the Little Outlaw Office and instruct you to Penbrook Landing. There, you will leave your car and we will shuttle you up to Berry Bridge, your launch point. You then float at your own leisure back to your own vehicle. Visiting Valentine? For groups of 8+ we can shuttle you from your hotel/motel in Valentine and drop you to Berry Bridge where you’ll begin your trip. Once you’ve finished tubing, we will meet you and take you back to your accommodation. Please call to book our shuttle service! Each member of your group will be required to sign a waiver before embarking on your tubing trip. Parents are asked to sign these on behalf of their children under 18. Our tubes comfortably fit one adult however children under 12 are welcome to share a tube with an adult for an additional cost. If two children want to share, one will pay full price and the other will pay the extra rider fee. Up to ten tubes can be tied together in a group. They provide great service and are very easy to work with. Extremely friendly staff. Definitely a highlight of my vacation. They are incredibly friendly, very helpful, and make sure you have a great time! We've been going through these guys every summer for the past seven years for tubes, and their service is fantastic.